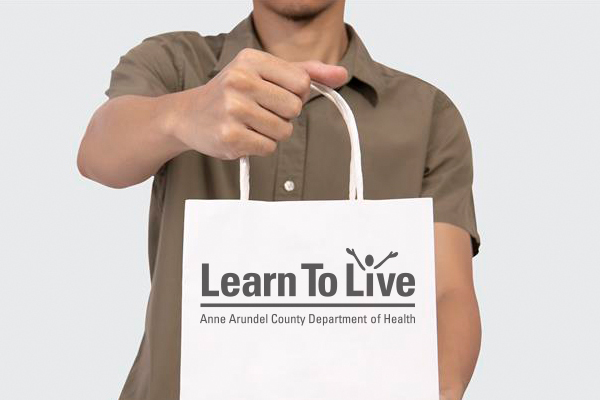 The Anne Arundel County Department of Health’s Learn To Live program offers a variety of free materials on cancer prevention and healthy living topics. Those who live and work in Anne Arundel County can request one of any of the items listed below. Order by phone. Call the Learn to Live Line at 410-222-7979. Choose any of the following topics to view materials that are available for order or download. Orders are limited to one of each item. For larger quantities, please call 410-222-7979. Some materials are available in Spanish. Colorectal Cancer Prevention Information Kit in English: Information on prevention and screening for colorectal cancer. Order or download now. Colorectal Cancer Prevention Information Kit in Spanish: Information for Spanish speaking adults on prevention and screening for colorectal cancer. Order or download now. Men's Health Kit: Information for men on cancer prevention and screening and tips for adopting a healthy lifestyle. Prostate Health and Screening Fact Sheet in English: Educates men about prostate health and prostate cancer screenings. Order or download now. Prostate Health Fact Sheet in Spanish: Educates Spanish-speaking men about prostate health. Order or download now. Get Sun Smart Kit in English: Skin cancer prevention tips for youth and adults. Order or download now. Get Sun Smart Kit in Spanish: Skin cancer prevention tips for Spanish-speaking children and adults. Order or download now. Women's Health Kit in English: Information for women on cancer prevention, free mammograms, Pap tests, and cancer checkups for eligible women. Womens' Health Kit in Spanish: Information for Spanish-speaking women on cancer-prevention, free mammograms, Pap tests and cancer checking for eligible women. Don't Let Us Get Hooked on Tobacco: Helps parents raise smoke-free kids. Order or download now. Smoking Stinks:Online resource to educate kids and teens on the dangers of tobacco and e-cigarette products through games and activities. Go there now. Merchants Only - Tobacco Sales Compliance Kit: Own a business that sells tobacco? Order materials to help you make sure you're in compliance with the law. Power to Quit Smoking Kit: Easy-to-use guide to help African Americans stop smoking. Order or download now. Quit-Smoking Kit in English: Includes the "Roadmap to Quitting" Workbook with easy-to-use steps for quitting and staying smoke-free and information on free smoking cessation classes. Order or download now. Quit-Smoking Kit in Spanish: The Spanish-language "Roadmap to Quitting" Workbook with easy-to-use steps for quitting and staying smoke-free and information on free smoking cessation classes. Order or download now. When Will You Adopt a Smoke-Free Home Rule? Explains the effects of secondhand smoke on children and families. Download now. 3 Great Plates For Your Family Sheet: Includes MyPlate nutrition tips and recommended serving sizes for various age groups. Food Sense Booklet: A guide to help plan, purchase and prepare your own healthy meals on a budget. Order or download now. Healthy Eating Kit in English: Includes nutrition tips and free resources to help make healthy food choices. Order or view the Eat Healthy webpage now. Healthy Eating Kit in Spanish: Spanish-language nutrition tips and recipes. Healthy Events and Meetings: Provides ideas and examples. Order or download guidelines, policy or checklist now. Healthy Events and Meetings in Spanish: Provides ideas and examples. Order or download policy or checklist now. Promoting a Healthy Environment: Promote a healthy environment at special events. Order or download the tips for conducting healthy celebrations, fundraising, and providing rewards at work, school, or club. Building Blocks: Newsletter for child care providers and parents. Addresses preventing injuries, improving nutrition and keeping kids healthy. Order Issue 20 or download any of thefollowing issues now. Health Notes: Learn To Live's newsletter. Order or download now. Let's Talk About... Tip sheets with advice on how to talk to children. Order or download any of the tip sheets now. Let's Talk About... Raising Healthy Children: A downloadable tip sheet with advice about how to talk to children and teach them healthy behaviors. Let's Talk About... The Media and Your Child: A downloadable tip sheet with advice about how to talk to children about advertising. Let's Talk About... Being a Healthy Family: A downloadable sheet with advice about how to keep your family healthy and safe everywhere you go. Playing it Safe: Brochure advising adults how to prevent injuries in children when playing outside. Download now.